The Green Workplace: solar powered cellphone - need I say more? Samsung Electronics has unveiled the world's first solar-powered smartphone - and it's made out of recycled plastic bottles.The back panel of the new Blue Earth touchscreen phone doubles as a solar panel, enabling users to "generate enough electronic power to call anytime anywhere," according to Samsung. The device also comes with an energy-efficient plug-in charger that draws less than .03 watts in standby node, the company says. The rounded, pebble-shaped handset is built from PCM, a plastic made from recovered water bottles. The entire device, including charger, contains no brominated flame retardants (BFRs), beryllium, or phthalate - potentially toxic substances common to some electronics products. Streamlined packaging is made from lightweight, recycled-content paper. 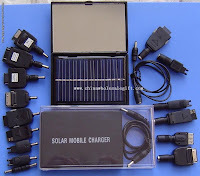 Finally, we don't have to carry around one of these 'universal' solar chargers with so many adapters you can start your own landfill with the leftovers! Wow, I can't believe they've actually made a cell phone out of recycled material. Well its a big step, but will anyone actually buy it? This is huge big step. A sustainable, solar idea that is complimented by a no toxins recipe of parts! It seems like a good idea, but you're pretty screwed if it's cloudy, or the sun is already down.